HONG KONG, Apr 20, 2018 - (Media OutReach) - Located on the 100th floor of International Commerce Centre, the tallest building in Hong Kong, sky100 Hong Kong Observation Deck (sky100) is Hong Kong's only indoor observation deck offering 360-degree panoramic views of the city and its famous Victoria Harbour. With the opening of Cafe 100 by The Ritz-Carlton, Hong Kong, sky100 is now world's first observation deck featuring a cafe operated by The Ritz-Carlton, Hong Kong Hotel, offering visitors the double delights of taste and visual pleasure. To mark the seventh anniversary, sky100 is kicking off its celebrations with fabulous offers from now until 30 June 2018, including the "7th Anniversary Double Delights Package" and "Sky-high Birthday Ice-Cream Giveaway". Come and share the joy with us at 393m above sea level! Offer Content: Package priced at HK$188, including one adult standard ticket and a HK$50 dining voucher for use at Cafe 100 by The Ritz-Carlton, Hong Kong. 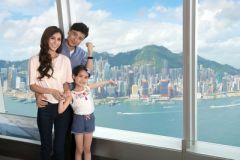 Offer Content: By taking a photo at sky100 using any of the designated photos frames and sharing it on social media, visitors can redeem a free soft-serve ice cream (value: HK$52). During the promotion, 50 cups of ice-cream will be given away every Sunday on a first-come-first-served basis, while stocks last. All major cities around the world have their own iconic observation decks, and sky100 is undoubtedly the one for Hong Kong. The deck, just opened for seven years, has received TripAdvisor's Certificate of Excellence for four consecutive years since 2014, recognising its breathtaking views and putting sky100 in the top 10% of TripAdvisor's listed attraction worldwide. The deck also enriches the visitor experience by showcasing Hong Kong's unique culture via interactive facilities including the latest mobile application, AR Fun Photos and 360 VR Ride. sky100 is the perfect place to enjoy fascinating views of Hong Kong, and is sure to be the highlight of your trip!